In this inspiring and provocative memoir, Caylin Moore tells the against-all-odds story of his rise from cruel poverty in gang-ridden Los Angeles to academic success at Oxford University, with hope as his compass. By all rights, Caylin Louis Moore should be dead, in prison, or stalking the streets of Compton with his fellow gang-members. Instead, he's a Rhodes Scholar, author, speaker, and role model for every kid deprived of hope in downtrodden communities. 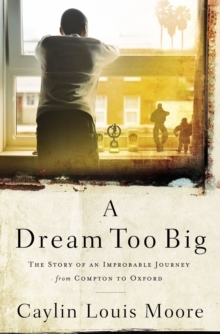 A Dream Too Big is the story of Moore's exodus from one of the most impoverished, gang-infested communities in the United States to the golden, dreaming spires of Oxford, England. After Moore's mother gathered her three young children and fled an abusive husband of nine years, leaving behind a comfortable middle-class life, Moore found himself in a bewildering and dangerous environment. The family lived in a neighborhood ruled by the Bloods, and Caylin often lay awake at night, terrified by both the sounds of gunfire outside and the scratching of rats and roaches moving in the walls. When Moore's father was convicted of murder and his mother was sexually assaulted in the hospital while recovering from open-heart surgery, Moore was forced to enter adulthood prematurely. Embracing his mother's steely faith in God and education, Moore skirted the gangs and the endemic violence of Compton to excel on the football field and in the classroom. Academics and athletics led to college scholarships, which led to a Fulbright and eventually the Rhodes Scholarship. Along the way, Moore cofounded a student organization that brought college athletes into underserved classrooms as inspirational speakers, role models, and mentors. Moore's eye-opening, inspirational story proves that, contrary to what others told him on his journey, there is no such thing as a dream too big. "A dream too big is a truly special book. Caylin's story is not just inspirational, it is instructional. I have admired him and his journey for a long time; read this book and you'll understand why." --Wes Moore, bestselling author of The Other Wes Moore, CEO of Robin Hood "I loved this story of triumph in praise of a sacrificial single mom and a kid who, against all odds, fought hunger-pains and gangs to make a dream-too-big become a dream-come-true. Through gunshots and the temptations of inner city poverty, Caylin Moore laced up his cleats, outran gangs, and caught the 6:00am bus on an empty stomach.